Might this not be a good moment to discuss economic questions? 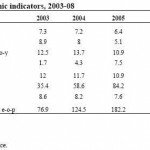 … The reason growth has been so subdued is because monetary and fiscal policy is so tight. This in turn is because ever since Russia came out of the post financial crash slump the Russian government and the Central Bank have been prioritising inflation reduction over growth. in order and building up its reserves whilst leaving businesses to sort out and fund their investment plans often by borrowing on the international money markets. The financial crisis showed the danger of this approach so the priority since the crisis has been to strengthen the domestic financial system to the point where it is possible for it to sustain a long term investment programme by drawing on its own resources. This is only possible in a low inflation environment. Though the inflation has roughly halved from what it was before the crisis, there was a significant inflation spike last year, which has forced the Central Bank to raise interest rates and to take further measures to restrict monetary growth. That inflationary spike was in turn caused by three factors (1) the poor harvest, with its effect on food prices (2) the over rapid credit growth at the start of 2012 and (3) the delay in the annual tariff increases to mid year and the way in which these were staggered throughout the autumn and winter. Of these three factors (2) and (3) were surely a consequence of the political needs of the election period. It is a commonplace that governments seeking re election loosen the purse strings to create a “feelgood” factor with the bills being paid once the election is out of the way. Russia has just seen a very pale example of this. 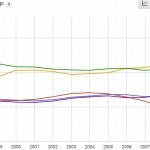 Anyway the result is that Russia not only has real interest rates, which by international standards are extraordinarily high (in most of the developed world interest rates are currently in negative territory) but, adding to the downward pressure, the government is also tightening fiscal policy by introducing its budget rule. The result is that demand and investment and therefore growth are being choked off. Not surprisingly the policy has its critics (Deripaska is being particularly outspoken) but it is a standard trade off that historically all advanced economies make. Japan during its glory days in the 1950s and 1960s repeatedly experienced growth pauses as the Finance Ministry and the Central Bank regularly tightened fiscal and monetary policy to deal with periods of surging inflation. Like Russia, Japanese policy in the 1950s and 1960s was haunted by recent memories of hyperinflation in the 1940s and early 1950s and of national dependence on foreign lenders. Of course an even more famous example of tight monetary policies being used to choke off inflation at the expense of growth (in that case even at the price of outright recession) was the Volcker Shock in the US in the early 1980s. I don’t think there is any serious possibility of Russia going through a contraction anything like as severe. My own view is that with monetary and fiscal policy as tight as they are, all other things being equal, inflation should fall in the second half of the year. The Central Bank has given itself a medium range target of 5-6% but with policy this tight I would not be surprised if it overshoots it. One way or the other, if inflation falls, interest rates will come down, monetary policy will loosen and growth will resume though this time in a much more subdued inflationary environment. This ought over time to make it possible for businesses to borrow in order to invest and for banks to lend for the long term without concerns at both ends that the value of loans will be eroded. It should also encourage saving fostering capital formation through deposit growth. In other words far from being an indicator of weakness the growth pause shows that the economy is being intelligently and responsibly managed and is not being sacrificed to reckless notions of growth at all costs. Without pointing any fingers, it is an altogether more responsible policy than what one sees in some other places. I would finish by saying that this policy also makes a great deal of political sense. 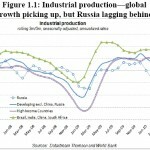 Though the policy comes in for noisy criticism from the likes of Deripaska (who as an industrialist has an obvious interest in getting the cost of borrowing brought down) Mark Adomanis has posted a useful graph from Levada on his blog that shows that inflation is far and away the most serious issue of concern for Russians. Anyway that is my take of the present position. I’d be interested to know if anyone disagrees or thinks differently and of what those who actually live in Russia and who have more direct experience of the economic situation there think of all this.